EXTRA-THICK CANVAS, STANDS STURDY: The top-quality 600D canvas is tear proof and double stitched for perfect light blocking; the canvas is supported by strong metal poles that are specially finished for smooth installation. EASY OBSERVATION OF YOUR PLANTS: Don't throw out your back checking on your plants! Our easy-access door unzips smoothly, and the observation window makes it easy to peek inside. 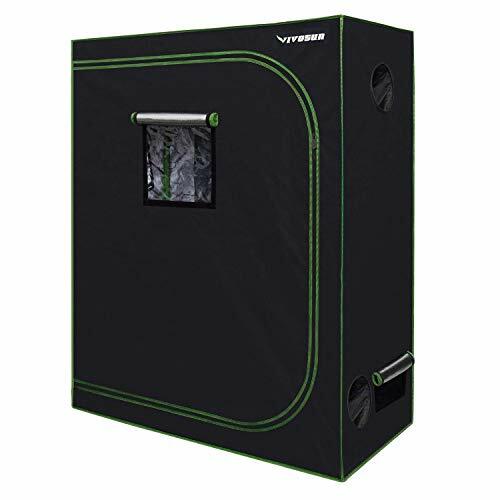 FAST INSTALLATION: VIVOSUN grow tents are easy to install even if you've never done something like this before: no tools needed! Quality backed by our ironclad, hassle-free 2-year warranty.